Several years ago, I was managing a small network of Christian radio stations on the Navajo Reservation. At the time, my wife worked alongside me as our Music Director. Having a heart for indie music, she’d occasionally search NoiseTrade in hope of discovering new artists we could put into rotation. One day, I was sitting at my desk doing some work, when she started playing a band I’d never heard before. The sound was absolutely breathtaking. I immediately stopped what I was doing and asked her, “Who is that?” “It’s a band called Rivers and Robots”, she replied, adding, “Aren’t they good?” They were. Fast-forward a few years, to the present. We’re now living in northeast Florida and, last week, Abbie excitedly tells me that that Rivers and Robots is coming to Jacksonville. She had seen an announcement on Facebook that the band— who hails from Manchester, UK— was going to be touring the eastern United States in promotion of their latest album Discovery. We weren’t going to miss it! The show was held at the Murray Hill Theatre. Before I get into the concert, allow me to say that the theater itself is one of the coolest venues I’ve ever had the pleasure to visit. It originally opened as a movie theater in 1949, however, in 1995 it was converted into a concert venue for the sole purpose of bringing live Christian music to the city of Jacksonville. The place has a great aesthetic! Opening for Rivers and Robots were three local artists, none of whom I was familiar with. Jordan Tyler Poole kicked off the night with a heartfelt acoustic set, alternating between original songs and hymns. The highlight was his rendition of Grant Tuller’s 1903 classic, “A Starless Crown”. Summer Frost and her band followed with a set that included her debut single “Be Still”. This bright young artist has a lot of potential and I’ll be interested to see where her music takes her. The last of the openers was Three Rivers Worship, a worship team from 3Rivers Church in St. Marys, Georgia. They were a powerhouse of a band, playing a thunderous set that had the crowd worshiping on its feet the entire time. Finally, after more than an hour and a half, the headliners took the stage. Now, full disclosure: we’ve played a lot of their music over these past few years, but in actuality, my wife and I knew very little about Rivers and Robots. In fact, we’d never even seen a photograph of the band prior to this show. When the lights went up, my wife and I looked at each other, stunned. “They’re just kids”, she said. We were genuinely surprised. They’ve been around for quite a few years now, and on top of that, there is an unfeigned maturity to their music and lyrics. We had mistakenly assumed they were much older than they actually were. But when they started playing, it was unmistakably them! I had wondered, on my way to the show, how their music would translate live— after all, the sound on their records is so uniquely smooth and flawless. 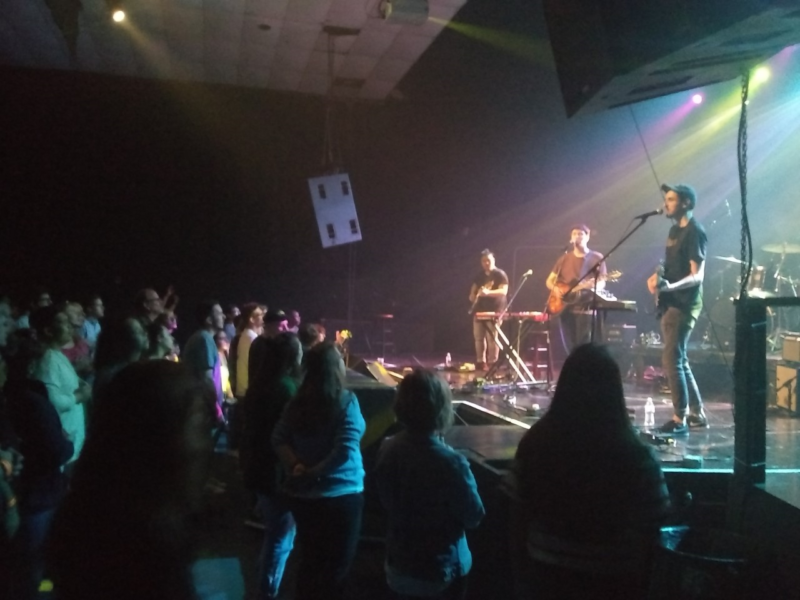 That night, the band was incredibly tight and lead singer Jonathan Ogden’s voice soared through the old theater as they opened with two songs from Discovery: “Dreams” and “Call Your Name”. Then suddenly, the show came to a screeching halt. “Bear with us”, Ogden said, as he explained to the crowd that they were battling technical difficulties— particularly with the large screen that displayed their lyrics. “An hour before we started tonight, we were down at Target buying extension cables,” he half-jokingly admitted to the crowd. 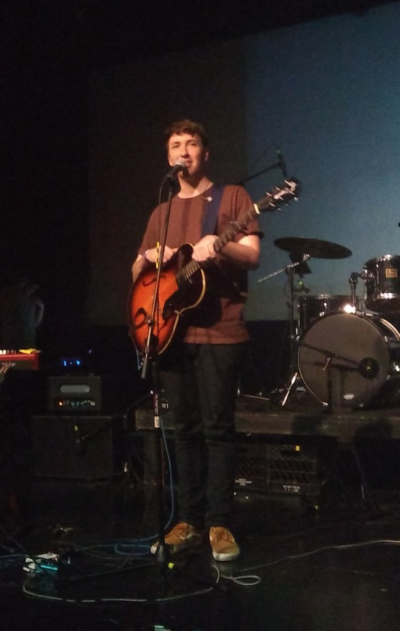 To kill time, Ogden played a song called “All My Love” from his 2017 solo EP, entitled “Winter”. Not originally part of the set list, this captivating worship song was a pleasant surprise, early in the show. After that, their video was back up and running, though it would cause them occasional trouble throughout the night. The band played more than a dozen songs, most of which were from their latest record. Due to the technical issues, there were gaps in-between songs that forced the band to talk to the crowd, possibly a little more than they were used to. These moments proved to be some of the most endearing of the night, as the guys shared stories about their first ever visit to Florida. Remarking that the band had just eaten at its first IHOP, bassist Nathan Stirling asked the crowd if there were any “better” restaurants in the area— to which an audience member quickly responded, “Every restaurant is better!” The imperfections of the evening actually helped make the show a more intimate experience— both band and audience seemed loose and relaxed, while at the same time maintaining a heart of worship. 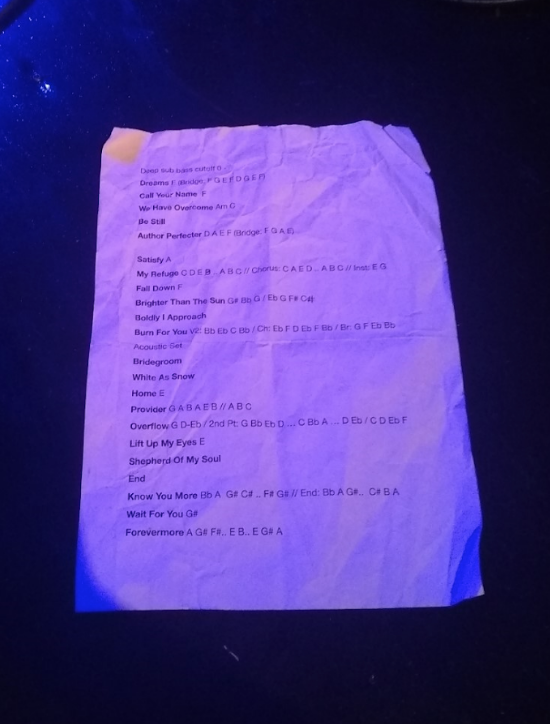 While the set list heavily featured songs from Discovery album, the band did include a few highlights from their past records, such as “We Have Overcome” from 2014’s “All Things New” and “Lift Up My Eyes” from 2016’s The Eternal Son. Ogden shared that the latter song’s catchy call-and-response chorus was inspired by a 90’s style of worship that he and his bandmates love. With the energetic crowd up on its feet, dancing and singing along, it was easily my favorite moment of the night. Following “Lift Up My Eyes”, they ended the concert with a gorgeous song from All Things New— “Shepherd of My Soul”. They thanked the crowd and, in a very quiet and unassuming manner, left the stage— no encore necessary. While the concert gave us a glimpse of their individual personalities, the focus was undoubtedly on God, from beginning to end. While I enjoyed their music a great deal before attending the concert, I left the show a full-fledged fan of Rivers and Robots! In truth, I don’t particularly like a lot of modern worship music, yet this band’s thoughtful lyrics, matched with their other-worldly sound, minister to me in a deep and profound way. My only regret is that their U.S. tour didn’t last longer, so that more of our friends here in the United States could have had the chance to see them. Only a small handful of east coast concerts had been scheduled this time around, however, the Discovery Tour has proven to be the band’s biggest yet and they are continually adding dates. If and when Rivers and Robots comes to your neighborhood— whether that may be— do yourself a favor and check them out! In the meantime, check out their music (and tour schedule) at www.riversandrobots.com.